Casino 777 is a perfect place to spot Belgian tables. The website wants to be known for offering high quality games and a responsive customer service. The connection to one of the oldest casinos in the world (Casino de Spa) makes it all the more appealing. Unfortunately, the good stuff is primarily reserved for the Belgian public. Players from other locations may have trouble accessing the exciting games. The promo section page is blank at this point in time. It's unclear whether this is a one-time issue, or a more persistent problem. However, the main page showcases the daily tournaments which are a source of some great prizes. The players are also encouraged to check out the special Casino 777 Bonus deals, which have very large cash prizes. 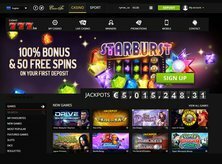 Likewise, there is the possibility of accessing bonuses of up to €100. The jackpots can be huge! The casino's winners list shows the names of the players that have won prizes by playing particular games. The names of the actual games are mentioned in that section. The players are even encouraged to „like the casino" on facebook. That way, the casino can let them know about new casino contests, bonuses and free spin offers. A few deposit options are shown at the bottom of the main site. They would include; HiPay, Skrill, PaySafeCard, PayPal and Neteller. For some reason, the major credit cards are not shown in that place. When it comes to security, the staff has implemented the highest standards. All private player information from the registration form has been stored away in a safe manner. It cannot be accessed by third parties. The Belgian site does not have a complicated registration process either. The whole thing only takes up a few minutes. Therefore, it's not a test of patience. The website is among a small number of sites that can operate in Belgium. In fact, it is licensed under the authority of the Belgian Gambling Commission. Right now, it is not accessible to players from the United States due to regulatory requirements. The casino has been able to achieve the no. 1 spot in its country of operations. The local clientele is treated quite well, which has resulted in a spike in traffic. The language support options are also excellent! The following languages have been integrated; English, French, German and Dutch. A category of „popular games" appears on the main page. 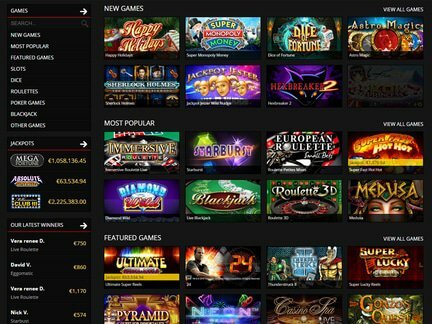 Here are some of the games that qualify under the heading; Immersive Roulette Live, Starburst, Live Blackjack, Roulette Petites Mises, Super Fast Hot Hot, Roulette 3D, 40 Super Hot, Diamond Wild, King of Slots, Lady Robin Hood, Zeus III, French Roulette, Koi Princess, Zeus 1000, Elements, Roulette Advenced, Basic Instinct, Twin Spin, Happy Holidays, Ultimate Super Reels, Royal Cash, Cash Spin, Valko Dice, Super Lucky Reels, Golden Goddess, Frog Story, Double Play Superbet, Love Guru, Gold Hold, Blood Suckers, Thunderstruck II, Mysterious Balloons, Lucky Clover, Where's the Gold, Dazzle Me, Happy Birds, 24, Piggy Riches, Wheel of Fortune: Triple Extreme Spin, Dracula, Pixie Gold, Jack and the Beanstalk, Super Lady Luck, Jackpot Rango, Million Cents, Quick Time, Live Casino Hold'em, Sherlock Holmes, Pyramid: Quest for Immortality, Jack Hammer, Merlin's Magic Respins Christmas, Spin Sorceress, Vault Dice, Absolute Super Reels, Mona Lista Jewels, Stud Poker, Mad Mad Monkey, Big Bad Wolf, Live Three Card Poker, Steam Tower, Break Away and She's a Rich Girl. The casino gets an above average score from players. The withdrawal problems are highlighted most often. People are having problems with the cashout, although the length of time seems to cause all the trouble. A few players were also disappointed with the redeem coupons from the casino. All inquiries can be directed to the staff via live chat. It's a great way to connect with them. E-mail, telephone and fax are likewise provided for contact purposes. The site is currently authorized by the Belgian Gaming Commission. This is a highly trusted authority. Its license means something to the casino community. The website staff can be congratulated for the achievement. The site has only been operating since 2012. Therefore, the fact that it has become a top casino spot for Belgians is all the more remarkable. I think that this will be a great spot, particularly for Belgians. They can launch tons of interesting games and particiupate in lucrative deals. The staff just needs to make sure that the promotions are explained in greater detail. I am definitely encouraged by the fact that the site has expanded the list of supported languages. I am also happy with the casino game offer. I found a lot of great casino classics plus some superb new game titles.